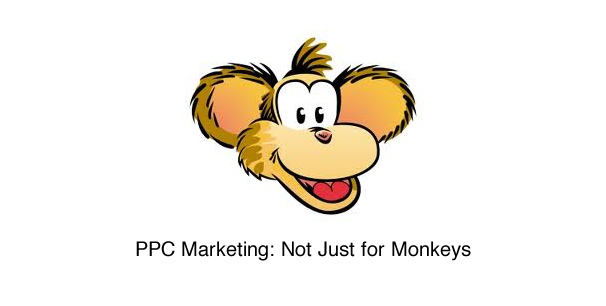 I was once told by a client several years ago that Pay Per Click Marketing was so easy that even a monkey to do it. While that comment was baseless and untrue at the time, it still stung. As you know, perception is reality; and if a customer truly believed that any monkey could run a successful pay per click program, then perhaps I had gotten myself into the wrong business. Years later, it has become clear to most that you need a qualified professional or team of professionals to help run your campaigns properly. Whether that expertise is in-house, from a consultant, or from an agency, Pay Per Click Marketing has gotten so complex that most businesses these days need an experienced set of eyes to help them maximize their investments. So where does this misperception about Pay Per Click Marketing being easy come from? Perhaps, the notion comes from Google itself. Google has long told advertisers that they can set up an account and be running AdWords in minutes. This is true. Google also has developed an extremely intuitive platform that makes it very simple for people to structure and create a basic advertising campaign. Google also incentivizes new advertisers with coupons, making the barrier to entry more attractive and the initial invoice a little less bitter to stomach. By making it simple to join, Google has perpetuated the myth that Pay Per Click Marketing is simple to do. Unfortunately, and as many advertisers have discovered the hard way, nothing could be further from the truth. Pay Per Click Marketing is a dynamic, ever-changing animal that needs constant management and attention. Optimization is a daily activity and, unlike traditional media, advertisers cannot just set it and forget it. Over time, Google has introduced a plethora of new options, features, and tools that when used properly can help all advertisers improve their return on investments. Outside companies have introduced automatic bidding platforms, competitive spy data, and A/B landing page-testing software – also geared at improving your bottom line. Most advertisers are unaware of these tools and often find their campaign performance dropping while their competitors, also can hide your links from competitors (who are actively engaging) are finding ROI’s exceeding far above their expectations. There is so much going on these days, that we’ve created a list of advanced Pay Per Click Marketing topics that should be incorporated into your campaign today, if you have a hard time understanding these make sure to get in touch with a SEO company. 1/ A/B Landing Page Testing – Test different landing page experiences to achieve higher conversion rates. 2/ Bid Management Software – Minimize your click costs and maximize your revenue by setting up bid management rules in advanced software platforms. 3/ Remarketing – Remarket visitors to your site as they travel across the web. Advertisers that do typically find higher conversion rates and lower overall acquisition costs. 4/ Google Display Network – Major gains can be had in the GDN. Advertisers that do often find lower average click costs and a new source of revenue. 5/ Advanced Reporting Tools – Deep dive into data to uncover areas of opportunity for optimization. Advertisers that do often find higher ROI’s. 6/ Negative keywords – Are you excluding bad keywords from your campaign? Advertisers that do typically find increases in click through rates; and an increase in overall conversions. 7/ Site Exclusions – Are you excluding bad placements in the GDN? Advertisers that do typically find increases in click through rates; and an increase in overall conversions. 8/ Phone conversion tracking – Most advertisers are tracking some form of conversions these days. Often left out, however, are phone calls. Advertisers that see the full picture make smarter decisions on their campaign performance. 9/ Product Listing Ads – Product listing ads convert at about 2x or 3x over the standard text ad. If you sell products, product listings ads are a no brainer. 10/ Google Enhanced Campaigns – The upgrade was mandatory on July 22, 2013. However, most advertisers have failed to upgrade fully and/or have not fully grasped what this means to their campaigns. To the uninitiated, this change means that Google serves your ads to mobile devices that generally convert at a lower rate. If you want less mobile impressions, have you made the updates? Conversely, if you want more mobile, what have you done about it? The days of monkeys running Pay Per Click Marketing programs were never a thing but it still may take a while for customer perceptions to follow. As more advertisers get lost in the sea of change, however, we believe eventually Pay Per Click Marketers will finally get their day. Check out this website to learn how you can buy bitcoin with PayPal. as it’s truly required point for the marketing methods. major search engine optimization upgrade.